Below are Box Office Collection Report of bollywood film 'Baadshaho' With his review, budget and total box office and worldwide collection status. Baadshaho movie lead star cast is Ajay Devgan, Ileana D'Cruz. 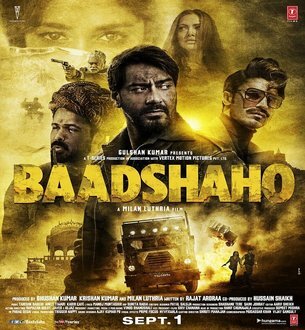 Baadshaho is an indian Action, Adventure, Drama Film of 2017, directed by Milan Luthria & produced by Gulshan Kumar. Baadshaho film Released in over 2800 screens in India and 442 screens in overseas. Trade analyst Taran Adarsh revealed the collection numbers and said, “Baadshaho starts on a SOLID NOTE… Fri ₹ 12.03 cr. India biz… Biz should only grow stronger on Sat and Sun. Storyline:- Emergency has been declared in India. Maharani Gitanjali(Ileana) from one of Rajasthan's princely states has already lost her privy purse. Now, she fears that she will lose the last treasure chest of gold which has been forcibly taken away from her. So she asks her trusted lieutenant, Bhawani (Ajay) to step in and plan a heist.